Even if you are a hobby beekeeper with only a few hives on your property, those will be enough to provide a generous supply of honey. 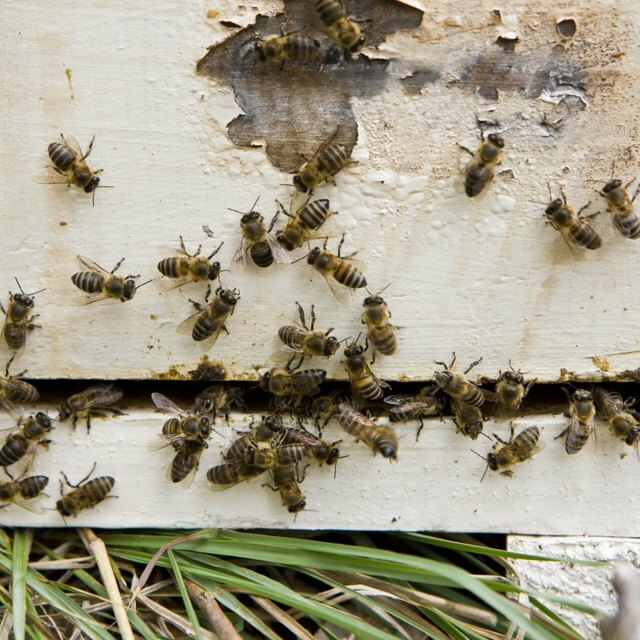 According to the San Francisco Beekeepers' Association, one well-established hive can produce up to 60 lbs. of excess honey in a very good year, and usually averages between 20 to 30 lbs. per year. When you've extracted honey from your apiary, it's important to strain it thoroughly to remove pieces of wax or any impurities it may hold, then store it correctly. Properly stored honey can keep for several years. Suspend the wire sieve over your large pot. If your sieve is smaller than your pot, push the 1/4-inch wooden dowels through the sieve mesh below its rim to create a cross-shaped framework, and suspend the sieve by balancing the dowels on the pot's rim. Make sure the structure is sturdy because honey is a thick, heavy liquid. Drape a large square of cheesecloth across the sieve. Push it into shape against the inside of the sieve, leaving excess cloth to hang over the edges of the bucket all the way around. Lay the square of wire mesh across the top of the bucket and sieve. Pour your extracted honey slowly onto the wire mesh and allow it to strain through the mesh, cheesecloth and sieve. Clean large bits of wax or other substances off the wire mesh as needed. You also may need to exchange the cheesecloth for a new piece if it gets clogged. Cover the bucket with a clean towel and allow the strained honey to sit undisturbed for several days. Air bubbles will rise to the top during this time, and you can skim them off with a spoon. Heat the honey to help keep it from fermenting when it's stored. Create a water bath in a large cooking pan on your stove top, place the honey pot inside and heat the honey to 150 degrees Fahrenheit. Use a candy thermometer to check the temperature and be careful not to overheat the honey. Pour the honey into clean, dry storage jars. Seal the lids tightly. Store your honey in a warm, dry room. Honey can crystallize if it's stored in a place where the temperature is below 80 degrees Fahrenheit. Placing the jar in a pot of hot water will liquefy the honey again. Jennifer Philion has been a professional writer and editor for more than 13 years, with experience in print and online journalism as well as marketing and public relations. She has written for "The Sporting News," the "Boulder Daily Camera" and the "Ogden Standard-Examiner" as well as magazines and online sites. She holds a B.S. in journalism from the University of Colorado-Boulder. Philion, Jen. "How to Strain and Store Honey from a Beehive." Sciencing, https://sciencing.com/strain-store-honey-beehive-5865329.html. 24 April 2017.